The Sand Dollar filter is the perfect high-performance sand filter. It's incredibly simple to operate and maintain, and it's built with long-term reliability in mind. Plus, its highly efficient design provides all the clean, crystal-clear water your pool requires year after year. Pool water is routed through the sand-filled pressure vessel. The sand traps particles so small they are undetectable to the naked eye. Over time, dirt accumulates in the spaces between the sand particles, causing the pressure in the vessel to rise. This signals you to "backwash" the filter by simply reversing the water flow and "knocking out" the dirt. Pool filter operation doesn't come any easier. The multi-port valve of the Sand Dollar filter puts all filter functions right at your fingertips - just rotate the handle to the desired position, and the Sand Dollar filter does the rest for sure and simple operation. Top mount, six-function, 11 1-1/2" multi-port valve features a pressure gauge and manual air relief for optimum filtration efficiency. Large-capacity SD 80 model is available with 11-1/2" or 2" valve. My tank has split at the seems. Where can I purchase only the SD 80 tank without the six way valve? I also have a problem with the Pentair SD80 filter with it splitting at the seams. Is the Hayward filter made with any better technology of have they improved the Pentair filter? The present filter that I have to change is the second one for my pool and it has been installed about 4 years. Is there any better out there? Please let me know. Thanks! How much sand does this model need? Are there more details about the connection hook up configuration? I need a filter for a small fish pond. Will this work or can you recommend something else, relatively cheap? BEST ANSWER: Many people use these types of filter for ponds. This would be a good sized filter for up to 10-15k gallons. Should be perfect for your fish pond. Will this replace the sd 40 sand dollar? BEST ANSWER: No. New pool new equipment.. greatest service from pool supply unlimited.. 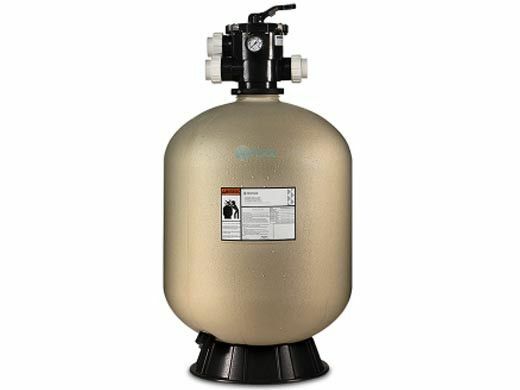 I have a sand filter for my pool and there are no labels on the filter. How do I determine the size of the filter? The tubes in the sand filter are suppose to go witch way? My husband put the screen part down and now it is stopping up. Great price for a great filter. Very happy with the service. The filter was easy to replace. I hooked it up myself and replaced the same exact model out with this one. My pool went from algae green to crystal clear literally within three days.